There are many building components that go largely unnoticed by residents or patrons in day-to-day use of facilities, but parking garages and balconies are the exception. Whether one is leaving their vehicle below an office building for the workday or enjoying nice weather outside their ninth floor residence, garages and balconies can both be facets of daily life. To maintain their serviceability through heavy use and exposure to elements, a plan to maintain garages and balconies is important. Prior to specifying repairs, FEA can complete condition assessments of balconies on swing stages and garages off-hours as necessary to gather information for recommending a course of action. Should concrete testing be needed due to encountered conditions, FEA can coordinate field sampling and testing to analyze concrete content and competence beyond visual observations. We can also perform investigations related to post-tensioning. This information can be used to refine a repair scope and make it appropriate for each project. Repair of parking garages can be a difficult project to undertake as an owner may lose revenue or residents may be displaced as spaces are taken out of service. FEA can help clients prioritize repairs and minimize disruption to garage use through collaboration on a phasing plan between parties. We also focus on specifying long-term repairs and implementing appropriate preventative measures to maximize the amount of time between needed projects. 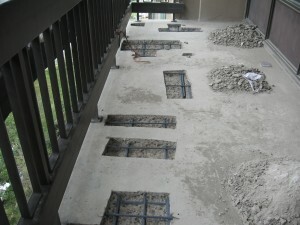 We are knowledgeable in precast, post-tension, and cast-in-place concrete parking structures. 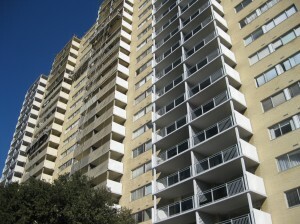 Balcony repairs can also be a tough undertaking for affected residents. Moving belongings indoors during favorable weather to make way for construction isn’t preferable, but is necessary to maintain their use. FEA’s experience in designing balcony repairs and performing contract administration can be used to complete repairs efficiently and improve balcony appearance through railing replacement or coating application, which also services to protect concrete in the future. To avoid phasing complications, minimize disruption, and maximize repair effectiveness, let FEA be a member on your team!